Those of you who regularly read up on walkhighlands know that I am an island lover. Ever since I've been to Islay for the very first time in 2009, I have returned to an island of some sort every year. In these 9 years, I have been to the Scottish islands 6 times (make that 7 as in one year I went twice). In 2017 I was on the Faroes. In 2012 and 2014 I was in London and in Venice, which, technically, are also located on Islands. However, this year it looked like this series would come to an end. 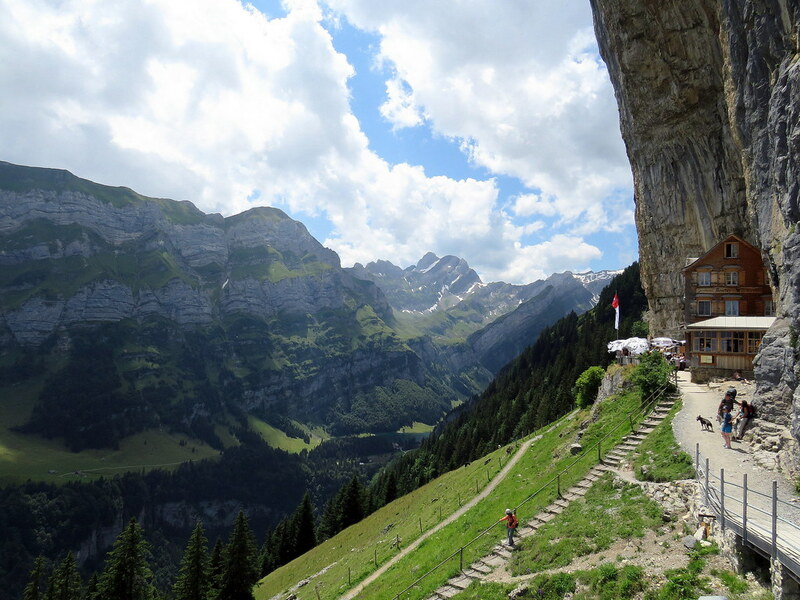 I spent my summer holidays in the Appenzell mountains (Alpstein). I bet you know this spot, the Berggasthaus Äscher. It once made the cover of the National Geographic as one of the most scenic spots in the world. Yet, it is not an island. 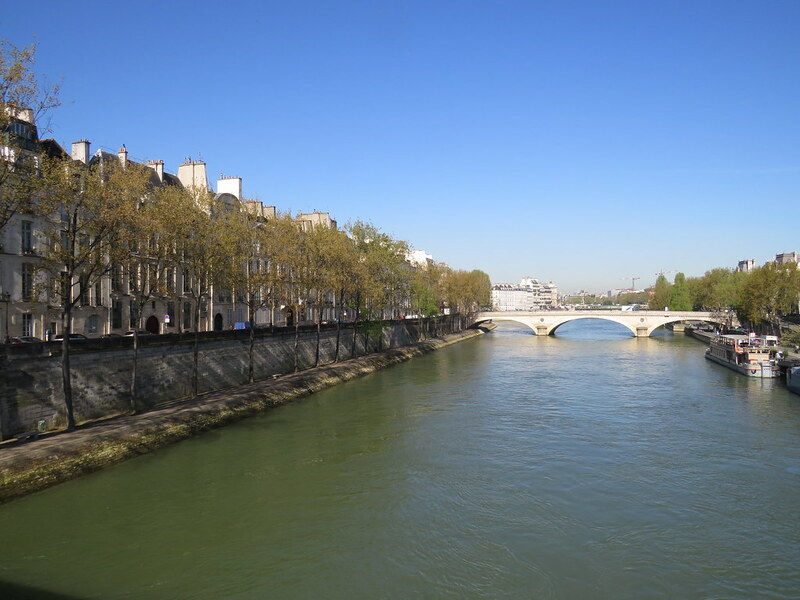 Granted, I had been to Paris in Spring and resided in an Air BnB on the Ile St. Louis, which is an island. But a river island, that does not count. Below left, Ile St. Louis. In the middle of the city yet with a distinct island flavor. 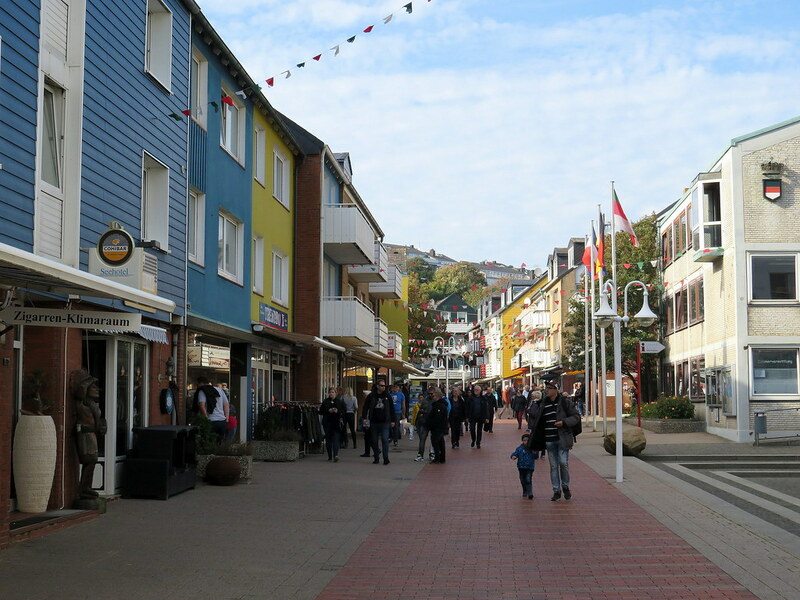 I had also made a day trip to Switzerland's largest island, Insel Ufenau, in Lake Zurich. An idyllic spot with ancient monastic buildings and a tropical feel to it on a sunny day. Yet, it is not a sea island, does not count. So, it looked like my year 2018 was going to pass without visiting a proper island. But then, my parents in law told me they planned a three weeks road trip through Germany from south to north in Autumn. I did not have three weeks of holidays left, but one. So I offered to meet them (with the missus) at the end of their second week in Hamburg and to organise the last week of their trip in northern Germany. That is when Operation Heligoland took form in my mind. 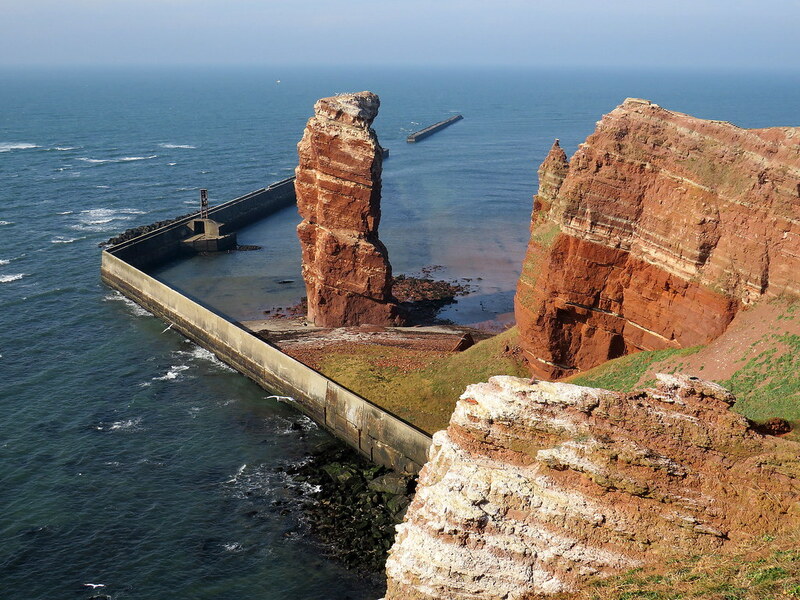 I had seen Heligoland on the maps a while ago and it nagged at me ever since. 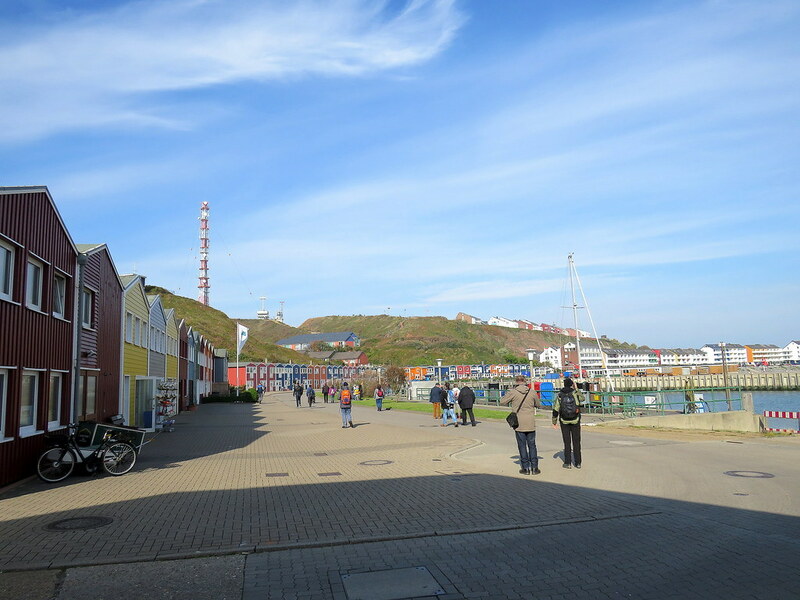 I figured out that it would be possible to reach Heligoland, Germany's only offshore island, from Hamburg on a day trip (4 hours in and 4 hours out). However, I had other things in mind. More "islandey" things... 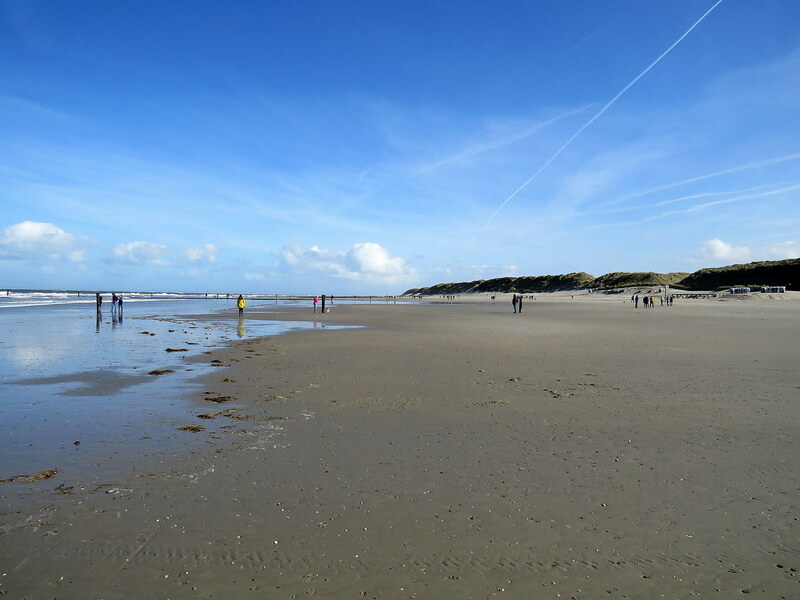 So I booked a hotel on Norderney, the second biggest of the East Frisian Islands, located in the famous wadden sea (Wattenmeer). We would spend two nights in Hamburg and then drive north west to Norden (what an imaginative idea to call a village in the north "Norden" ). 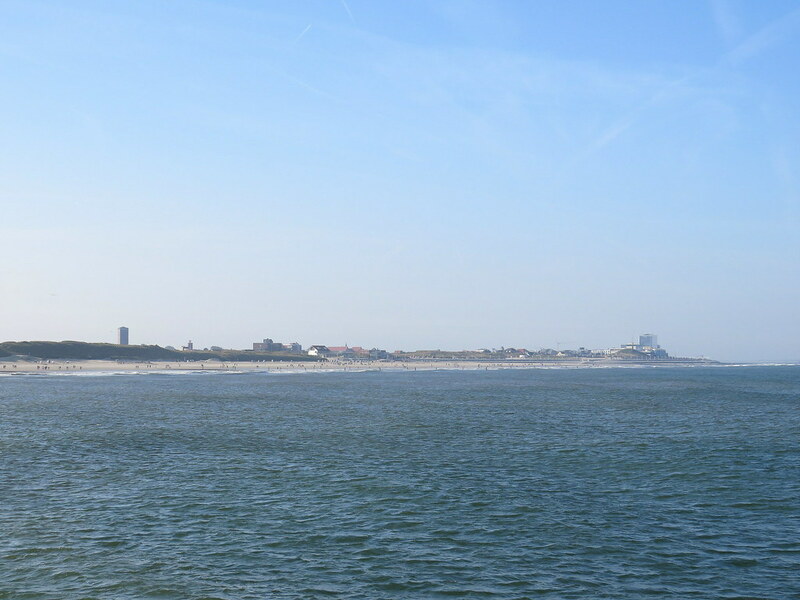 Anyway, we would take the ferry from there to Norderney, a 50 minute ride. 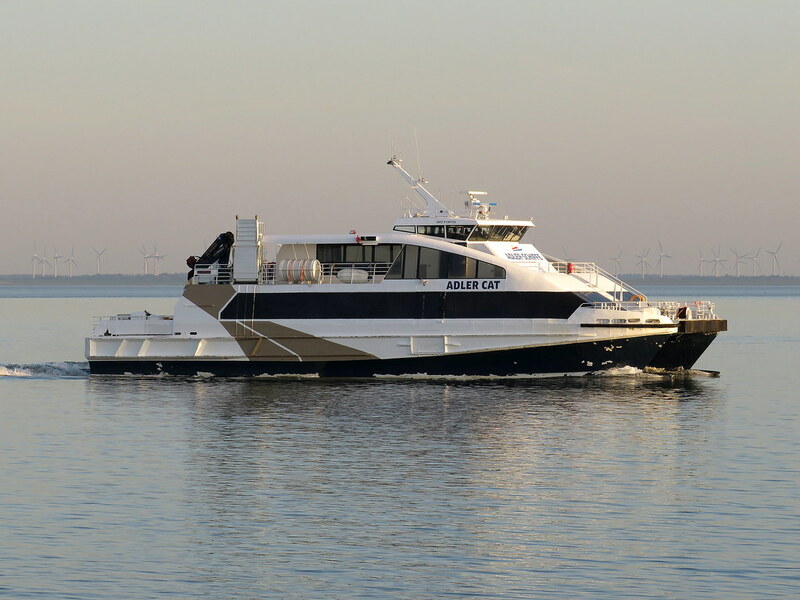 From Norderney, there are catamaran trips (2 hours in and 2 hours out) to Heligoland every Friday (in the season). Of course this is subject to the weather being clement so I took a gamble. The in-laws were game so we met in Hamburg on Sunday 30 September. 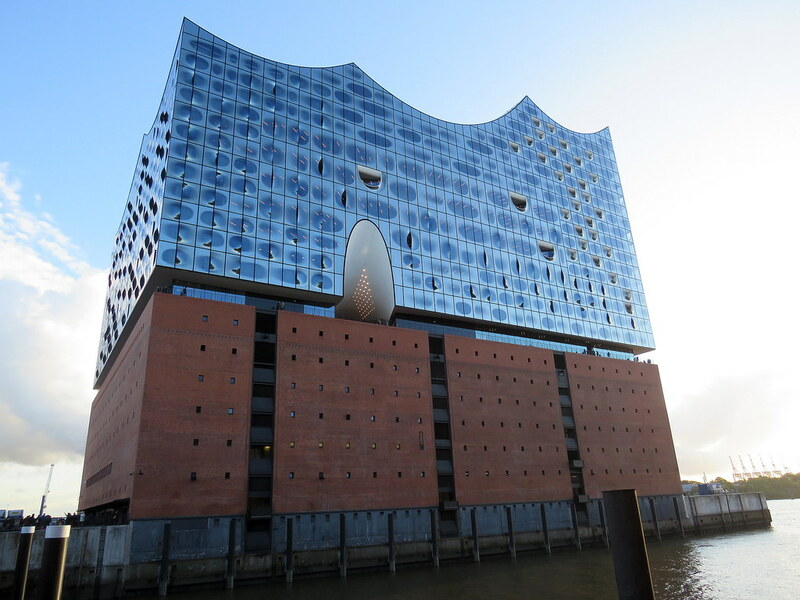 Hamburg is a nice city and we were particularly impressed with the new Elbphilharmonie concert hall, and the sunsets over the harbour. 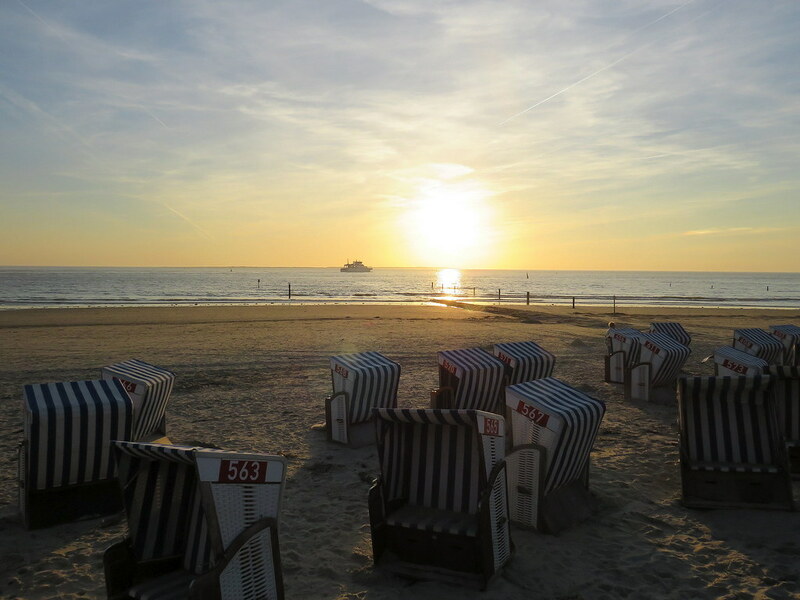 But this report is not about Norderney so fast forward three days. The weather forecast for Friday had been inconsistent to say the least. 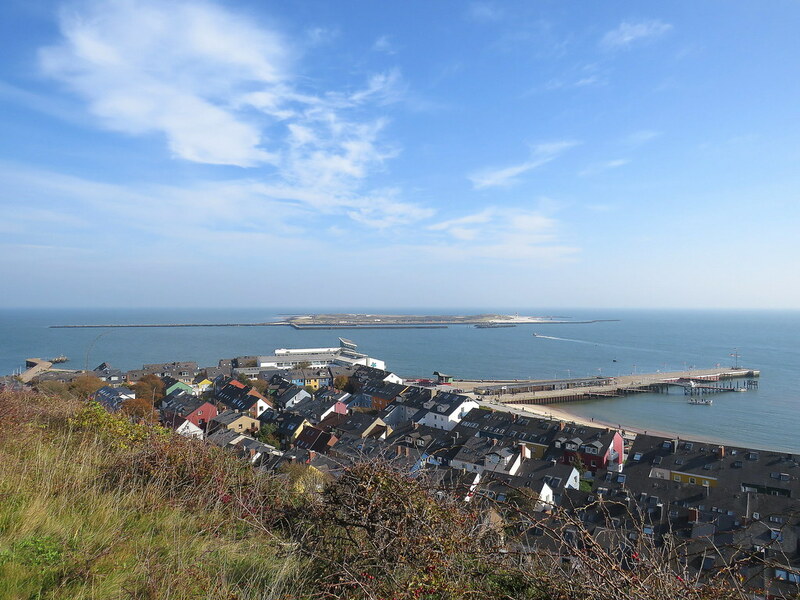 With these German islands, it is a bit like with the Scottish islands or the Faroes. You really only know how the weather will be on a specific day the night before. Thursday had started rainy and cloudy but cleared up until the evening and we had a great sunset. I'll spare you another cheesy sunset pic though. As always when doing a long boat trip, I had taken anti sea sickness pills to prevent just that and I was fine. Even if the sea was calm, there was a bit of a swell going at 28 knots. 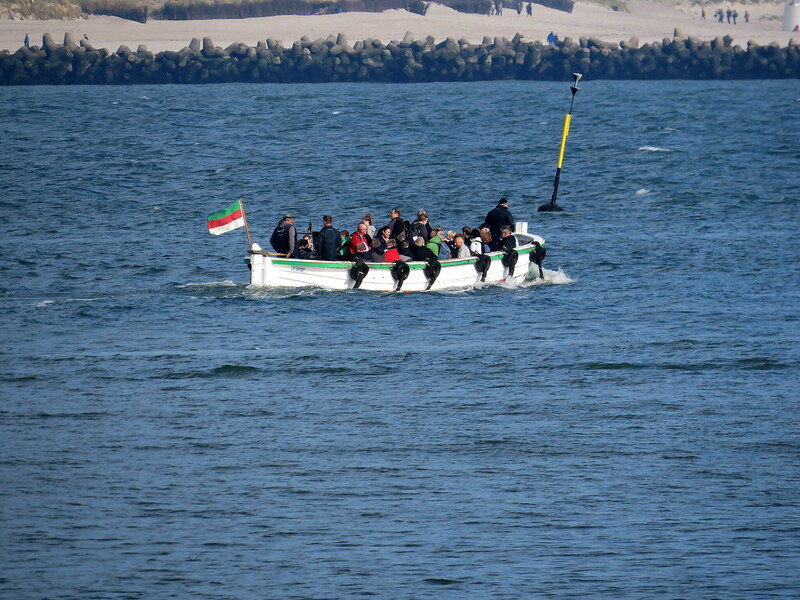 And it is a real sea trip as it is 70 km from Norderney to Heligoland. 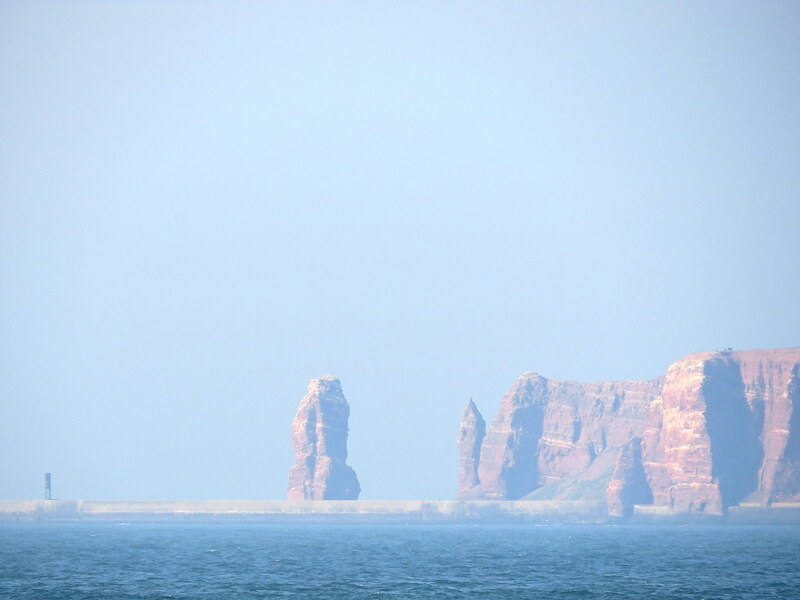 As a matter of fact, Heligoland is as remote as North Rona or St. Kilda! 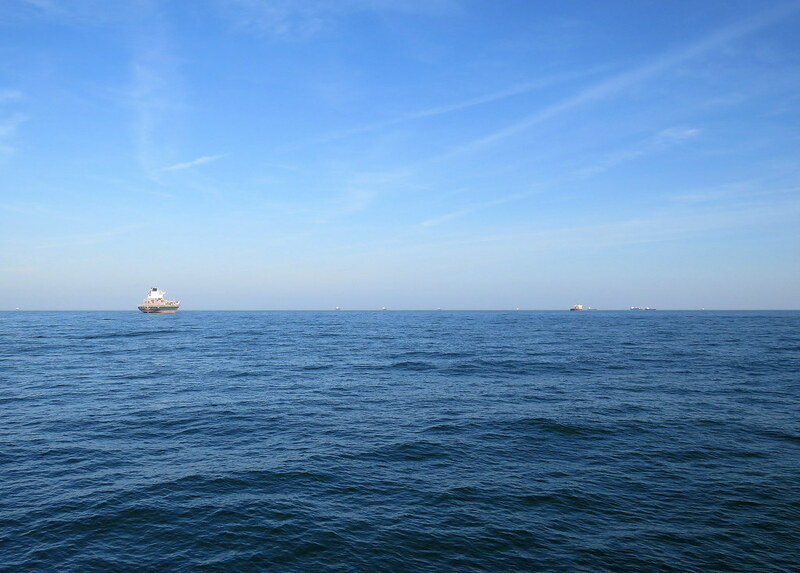 Soon, Heligoland came into view. 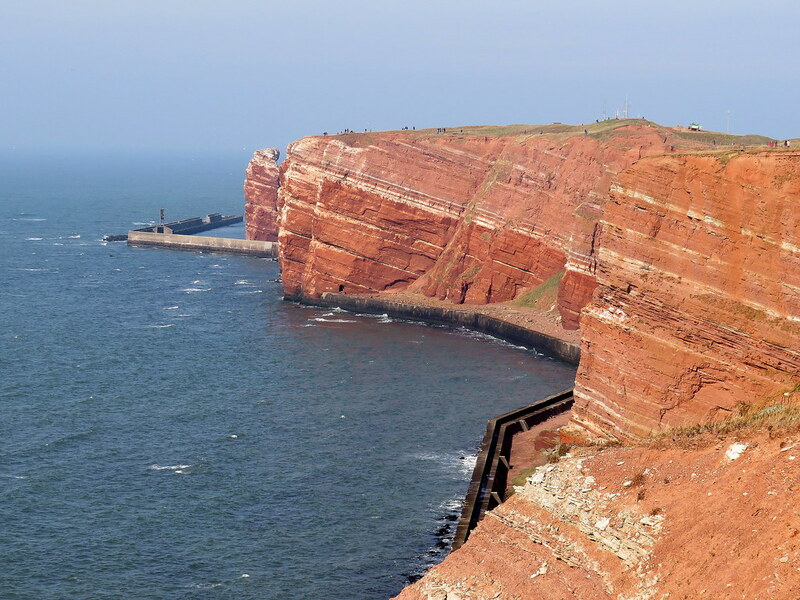 One of Heligoland's claims to fame is to be Germany's only off shore island. However, this is fake news as it still lies on the continental shelf. 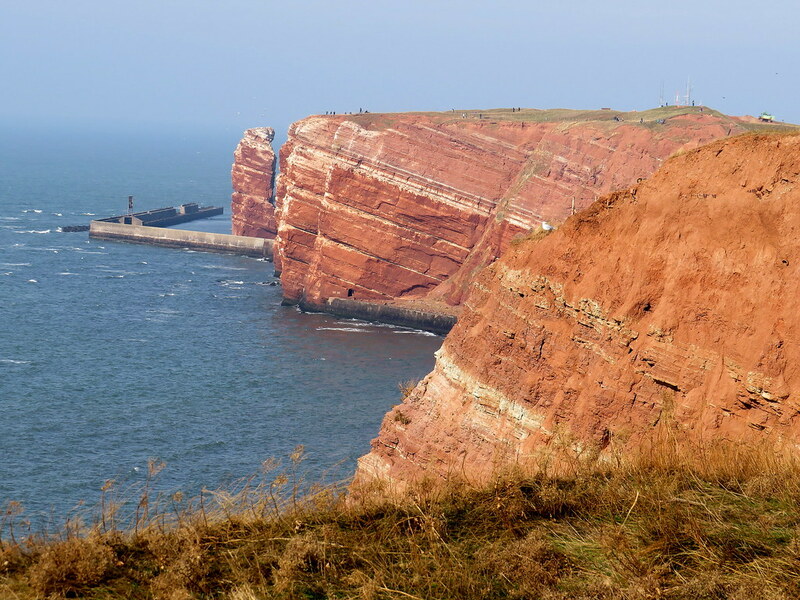 Below you have the red cliffs of Heligoland with its landmark sea stack Long Anna (Lange Anna). 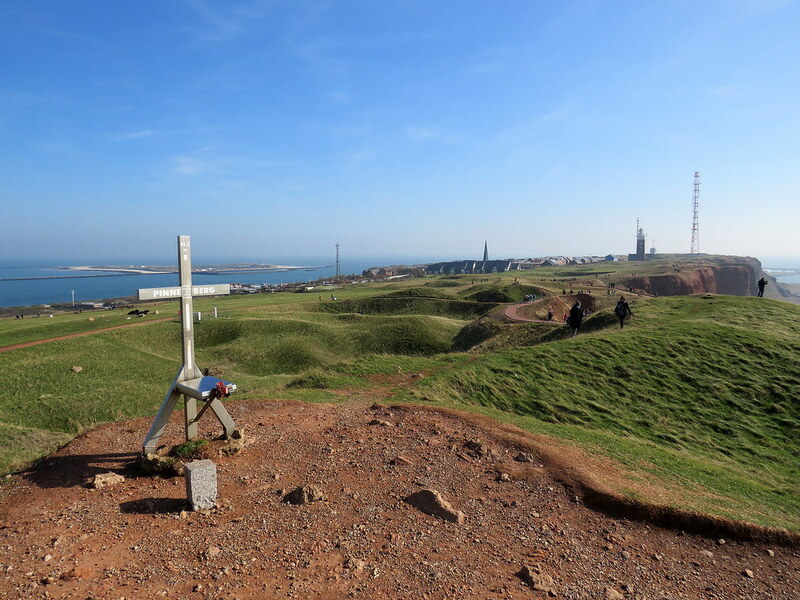 Next to the huge transmitter post you have the lighthouse, a former anti-aircraft gun tower (Flak). More of that later. 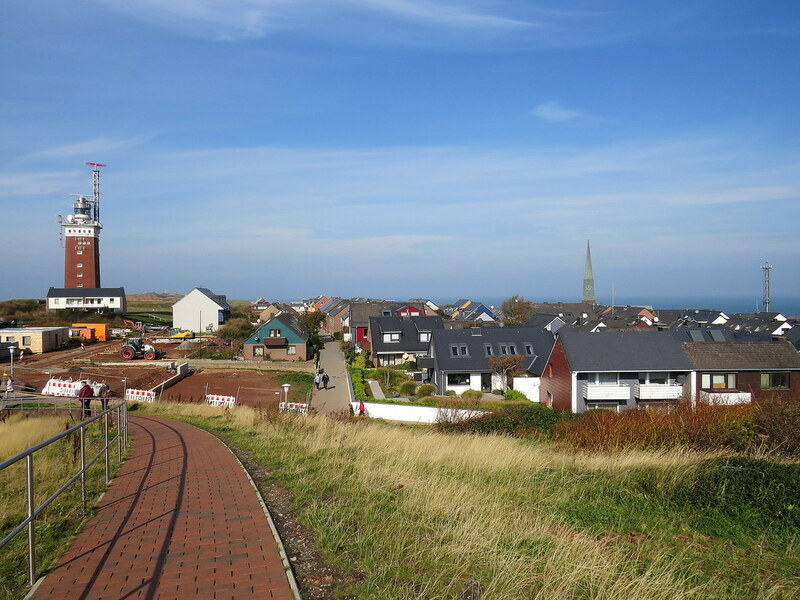 Approaching Heligoland you can see that a part of the village is on the seashore and the rest of the houses are on the cliff top. This is the Unterland (Lowland) and Oberland (Highland). 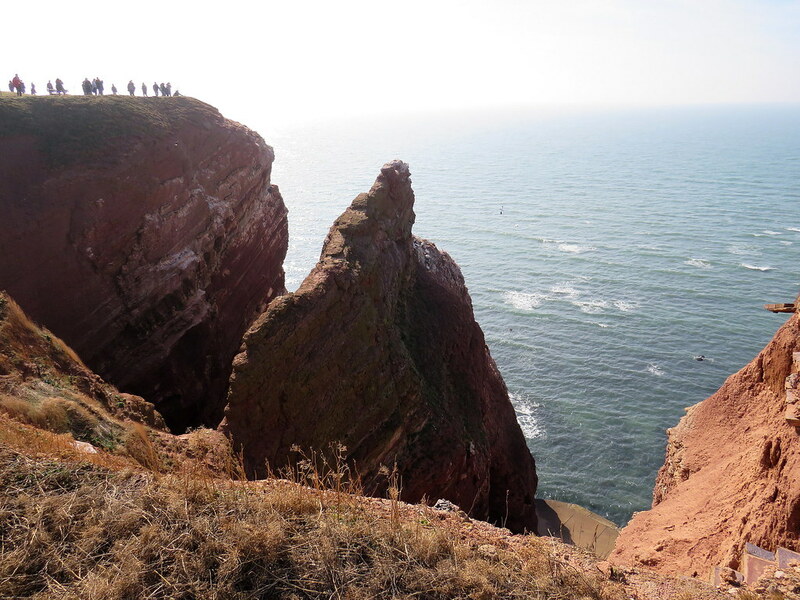 Heligoland is actually an archipelago consisting of two islands, the main island of 1 square km consisting of the red rock and a smaller sand dune island about half a mile to the east, aptly name Düne (the Dune). 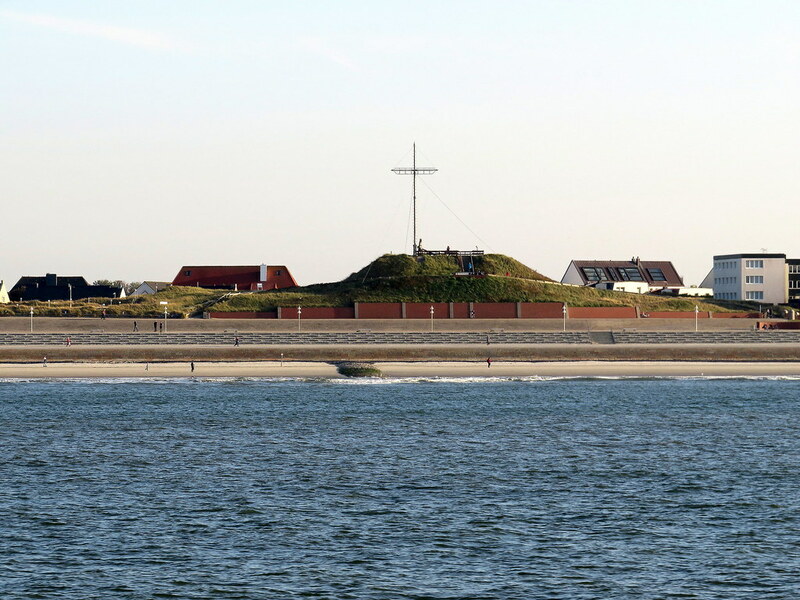 The main island and the dune were tied together by a sand dune tombolo until 1720, when a storm flood swept off the tombolo. On old maps, you still see the tombolo. Check out this map. In recent times an investor wanted to recreate this junction between the islands but the islanders wanted to have none of it. In the build up to World War I, Wilhelm built a large military port in the south of the island, more or less the size of today's harbor. During the war, the islanders were forced to leave their island and could only return after the war. After the war, the Germans were forced to destroy large parts of the south harbor and all military structures. 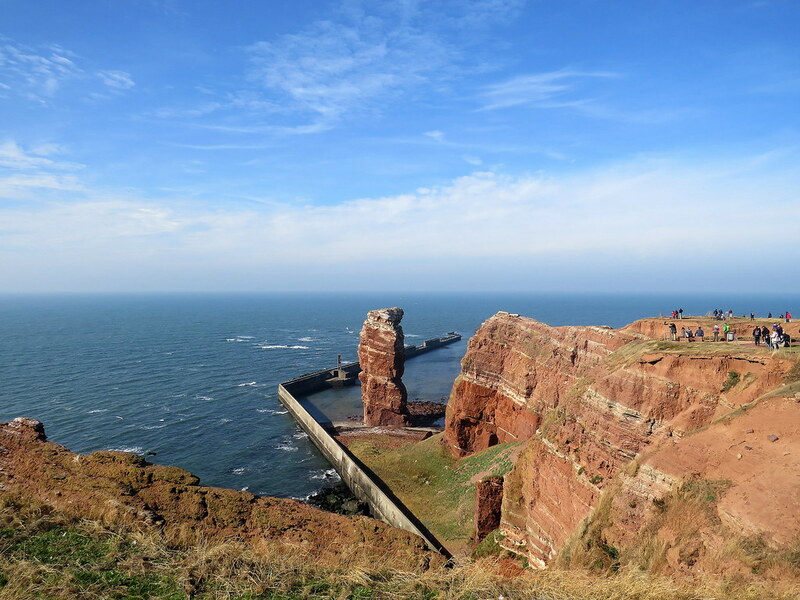 They started rebuilding it in the 1930ies and, under Nazi rule, the decision was taken to make Heligoland a humungous ice free off shore harbor for the entire German fleet, as a German Scapa Flow. The project went by the name of "Hummerschere" (lobster claw). If you google "Projekt Hummerschere" you will find plans of that megalomaniac project that would have increased the size of the archipelago times 15!!! Obviously, the allies could not tolerate this and so Heligoland took some severe bombardments, forcing the locals to flee the island in 1945. 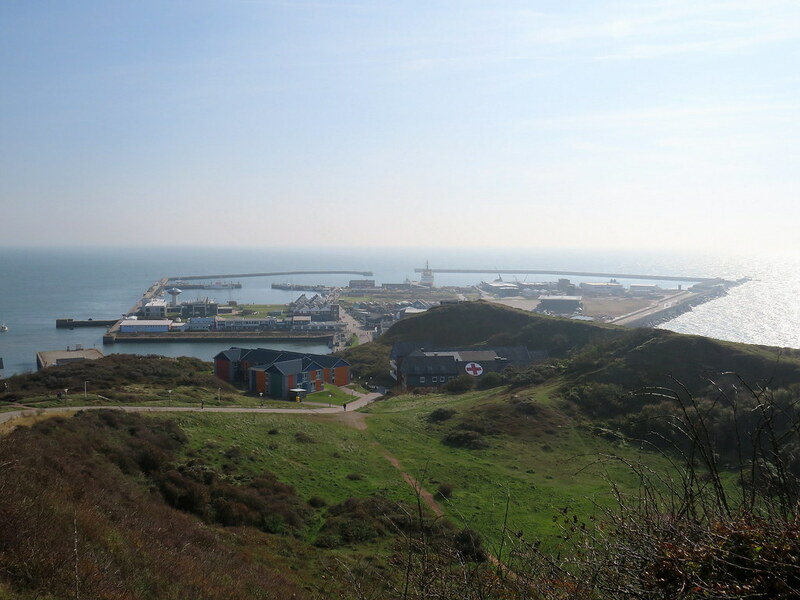 In order to destroy the military infrastructures for good, the Brits stuffed the submarine bunker with 6700 tonnes of explosives and blew the island up in 1947, an operation aptly called "Big Bang". You can find a video of it on youtube. 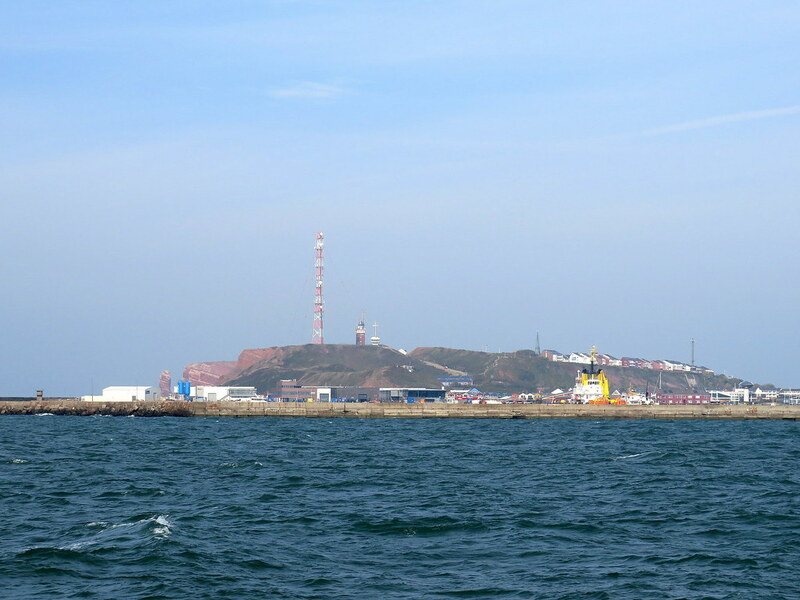 The explosion destroyed the military infrastructure and flattenend the southern tip of the island. 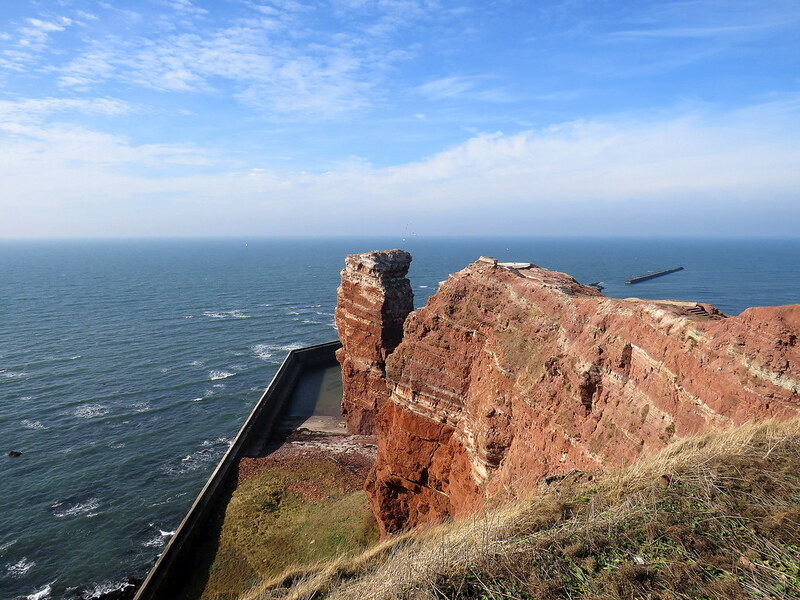 After that, the island was used by the RAF as a bomb test site until 1952 destroying any and all buildings safe for one Flak tower on the Highland. In 1952, after some non violent protest of two German students, Britain handed the islands back to Germany and the resettlement and rebuilding process began. The entire settlement was rebuilt from scratch and all houses on the island from today are from the 1960ies. Have a look at the second picture on the next link and you'll see it was literally from scratch. They are now protected as a unique example of that German building style. The island is exempt from customs and VAT so it became a popular daytrip to pick up booze and cigarettes, but this did not help its image. In recent times, there have been attempts to make it a popular holiday destination but the daytrippers are still the largest part of visitors. After Germany has decided to shut down all nuclear plants, alternative energies became a new industry, including off shore wind farms, some of which are serviced from Heligoland. The traditional lobster fishery, on the other hand, has taken a downturn and there are not many lobsters left in the seas around the island. There are other beasts though, namely seabirds and seals. 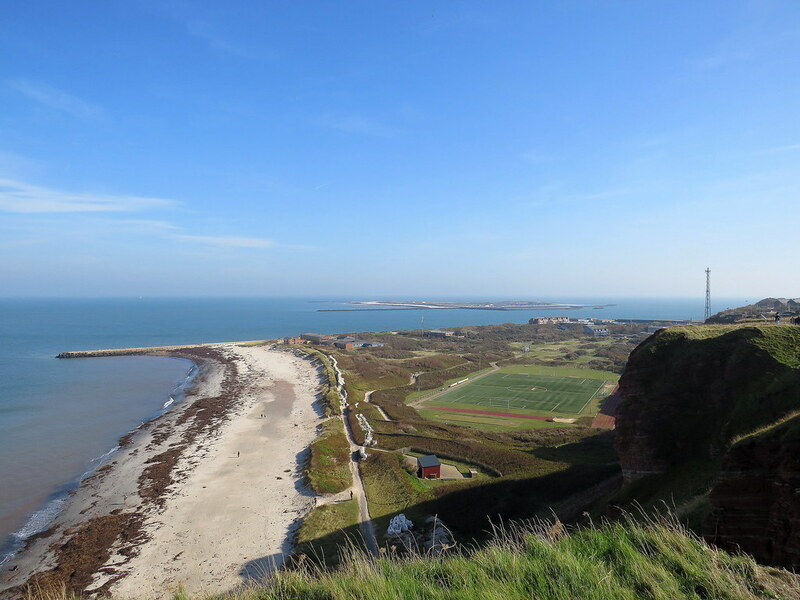 A few meters into the lobster huts you can either continue to the seafront and indulge in some duty free shopping in the Lowland, or turn left to walk up the Middleland to the Highland for the clifftop circuit. We did the latter. 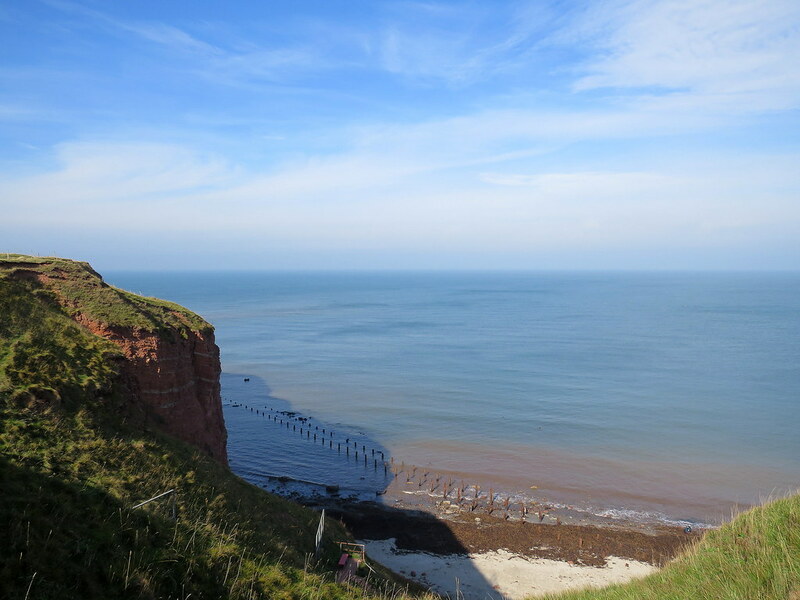 In the Middleland bomb craters, looking on the Paracelsus clinic, Heligoland's hospital. 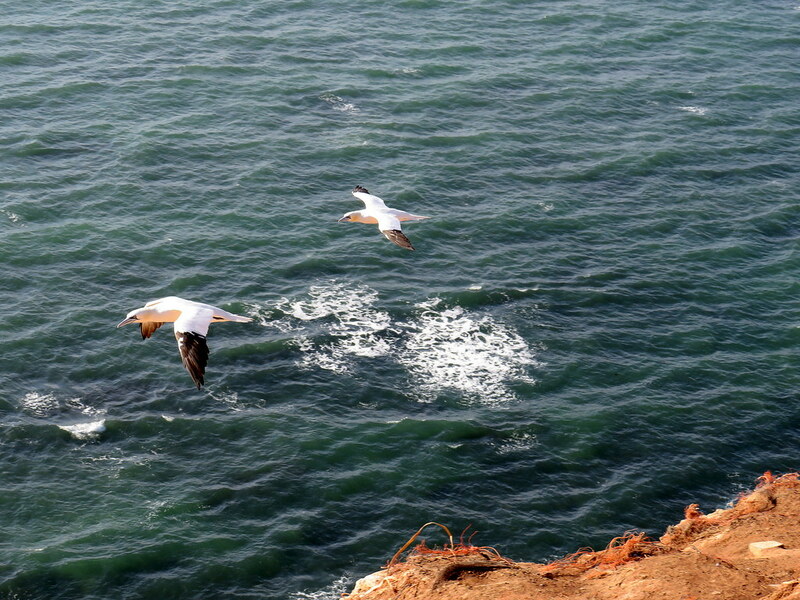 On the clifftop (ca. 50 - 60 meters) looking down on the uniform houses of the Lowland and over to the Dune, with the Dune ferry doing the crossing. 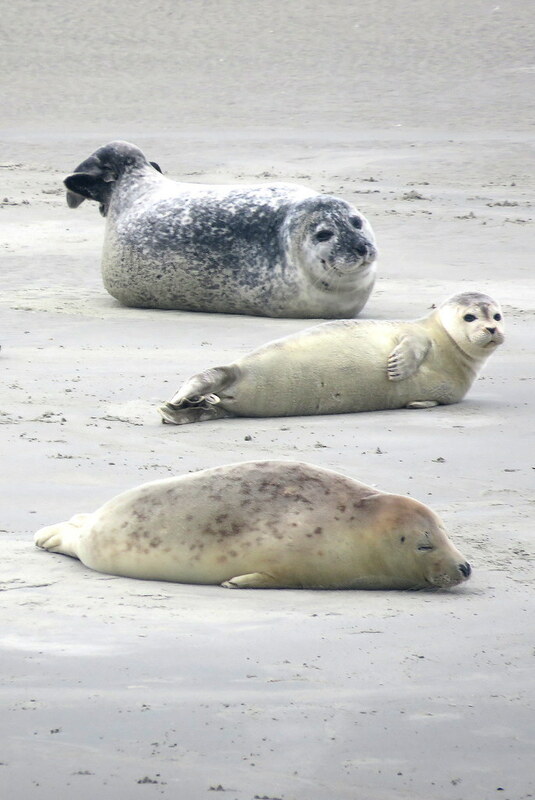 There are two bungalow villages, a restaurant and the airport on the Dune, along with sandy beaches (including a nudist beach) and an important seal colony. On the Dune, you are relatively safe from the hordes of daytrippers, as they don't have the time to visit the Dune on their short stint on the islands. I digress. Here we are looking back down at the harbor and the Middleland aka bomb craters. 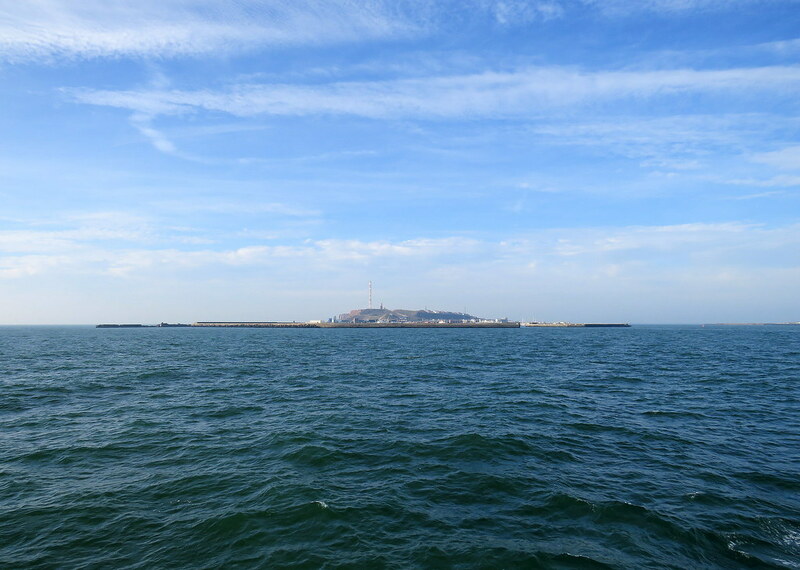 This bit of the island used to look the same as the rest of the rock at a height of 50 meters but Big Bang flattened it as the submarine bunker collapsed. Looking north. The red path is the clifftop circuit in a clockwise direction. To the left is the lighthouse, as set out above, a former FLAK tower and the only building to survive the bombings. Click below link to compare what the Oberland looked like after the war. Below the lighthouse the last building land on the island where new apartments are built for the windfarm service crews. A view over the Oberland with its uniform but colorful 1950ies housing and the spire of the Lutheran church. The houses were built close to each other and aligned so to withstand winter storms. 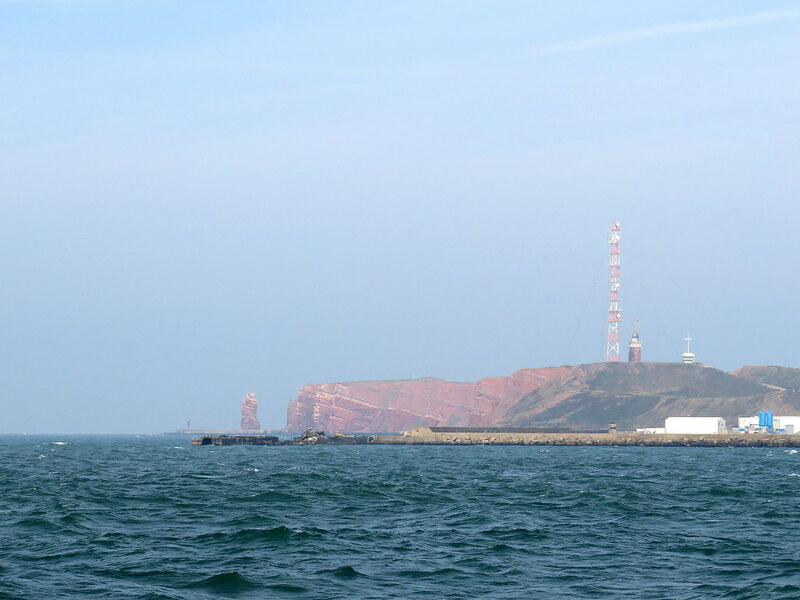 Very soon after the lighthouse and fenced off Bundeswehr transmitter post, you get a first glimpse of the fantastic red cliffs with Long Anna at the northern tip. Usually you would walk all the way to the northern tip on this path but as the missus needed a toilet, we cut across to the other side of the cliff, through the Oberland settlement where, at the stairs and elevator to the Unterland, there are public toilets as well as a few hotels, restaurants and duty free shops. From there, we took the way up north but this time approaching from the east cliff, where the path leads through the garden plots of the islanders. 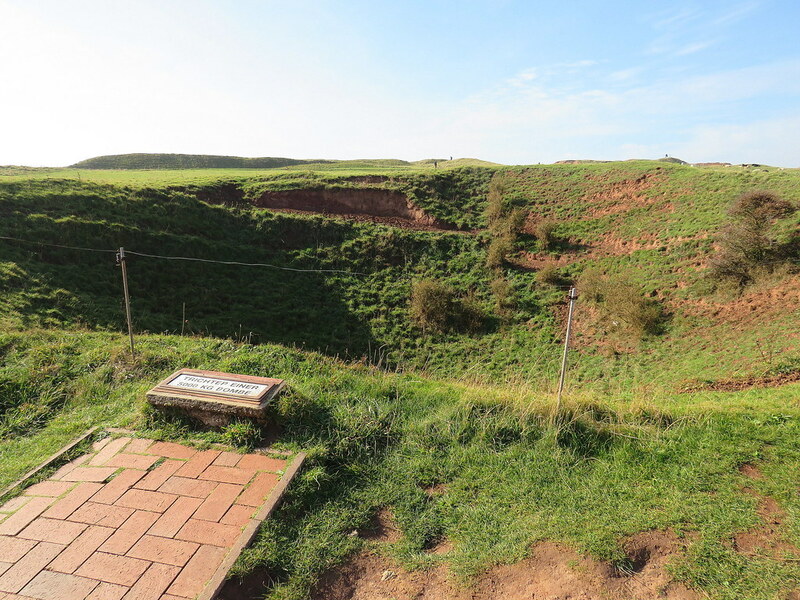 Once past this plots there are some bomb craters from the british bomb test times. Looking down the cliff you have nice views on the Nordostland (north east land), another relic of Project Hummerschere, and beyond to the Dune, which owes its current form to that same Project. Now, the Nordostland features utility buildings (like the seawater to drinking water transformation plant), a spa with heated outdoor pools, a youth hostel, a museum village, a football pitch and a nice sandy beach (no swimming there due to dangerous currents though). Stairs down the cliff. The posts in the water are from a supply pier used to build the military infrastructures on north east land. Finally, we reached the northern tip with Long Anna. 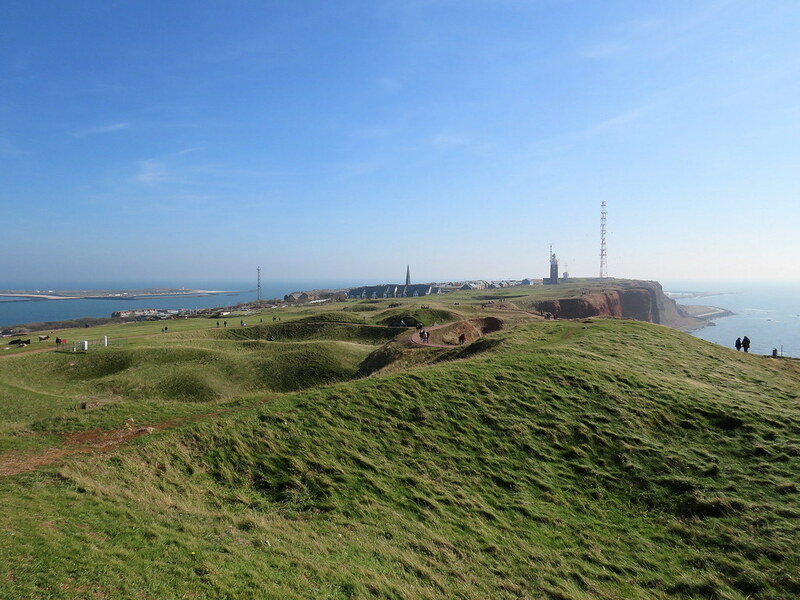 The clifftop path on the below photo is fenced off. 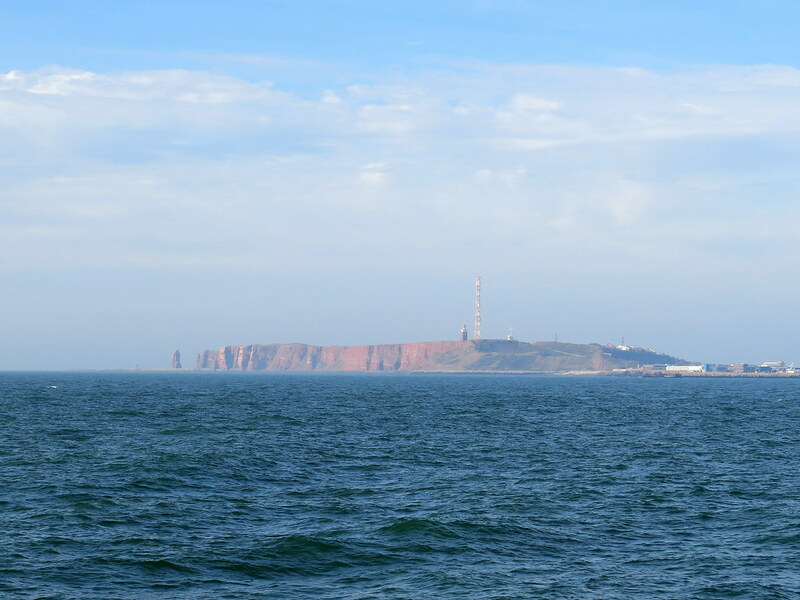 I was a bit disappointed to see no Heligoland traps though. Anyway, I was late in the season so my hopes to come across any interesting sea birds were low. 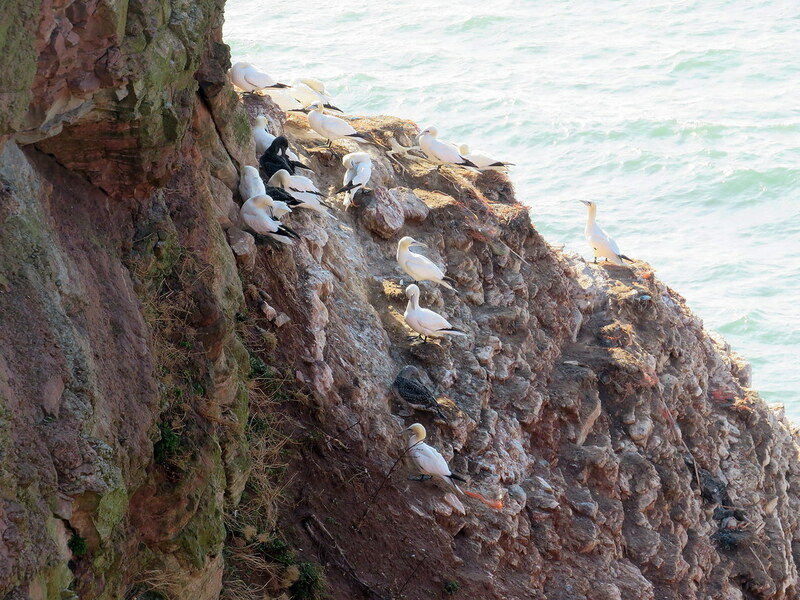 Most had gone, in particular Guillemot and Fulmar who do nest in the cliffs. However, I had some hope that one of the newcomers to the island would still be there: The Gannet. 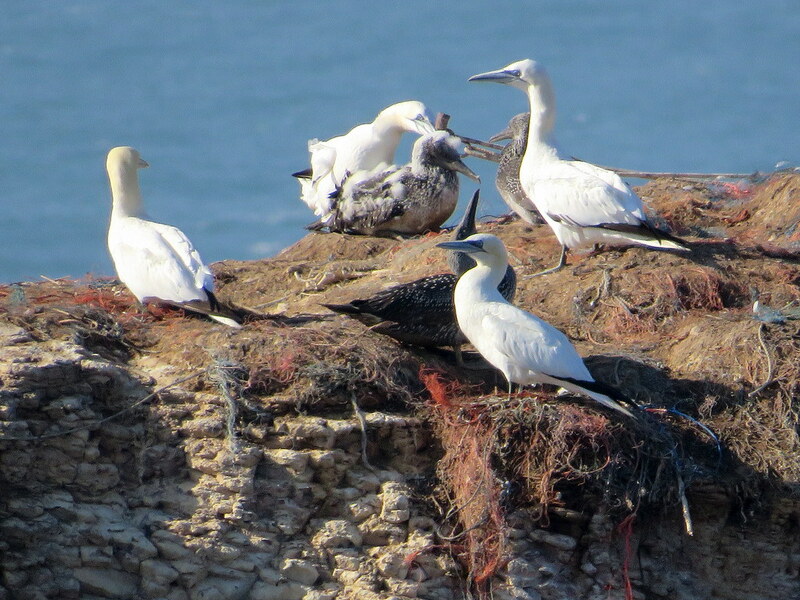 Gannets nest on the island since the 1990ies. Gannets are my favourite bird. 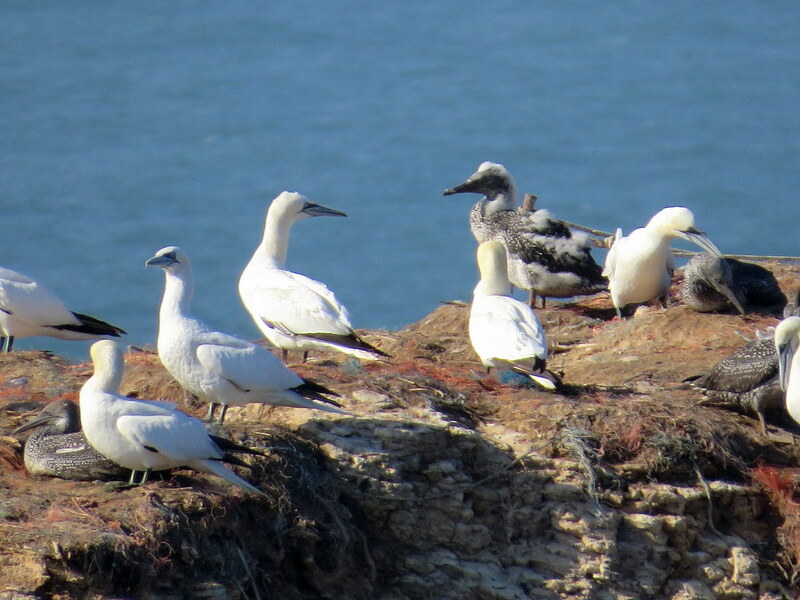 Gannets usually leave the north for warmer regions in the first week of October, aka at the time of my visit. And indeed, there they were, on the Long Anna! There were not many, but enough for me. 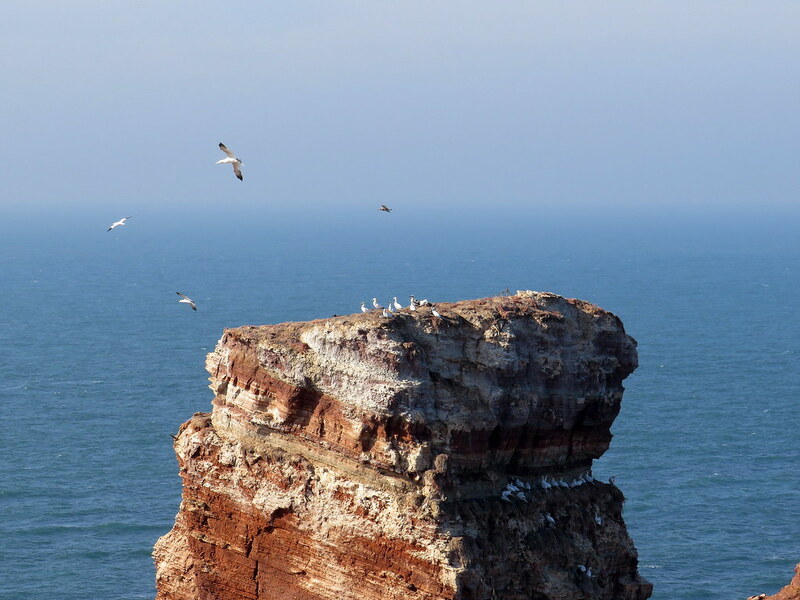 I think many had already left because on other pictures of the island you can see them all over the cliff top but at our visit only a few remained. I was very happy to see my favorite bird this year even if I have seen more impressive gannetries (St Kilda, Noss, Unst, Sula Sgeir. Sorry, enough bragging). As you can see, there were a few young birds so that may be the reason why they were still on the island, waiting for them to be able to fly all the way south? What you can also see is that their nests (aka the whole top of the stack) are mainly made of fisher nets. And in the air, where the Gannet displays all of its majestic elegance. As you can see, the sea is really shallow around Long Anna. It dries out at low tide. The sea floor is rocky, it is the so called Felswatt, a unique environment in Germany home to over 300 species of algae. Before heading back, there was one more thing to do: Climb the hilltop! The hilltop is at a staggering 61.3 meters above sea level. From there, you have nice views over the Oberland with its craters and beyond to the Oberland settlement and the Dune. Would make for interesting golf links, wouldn't it? 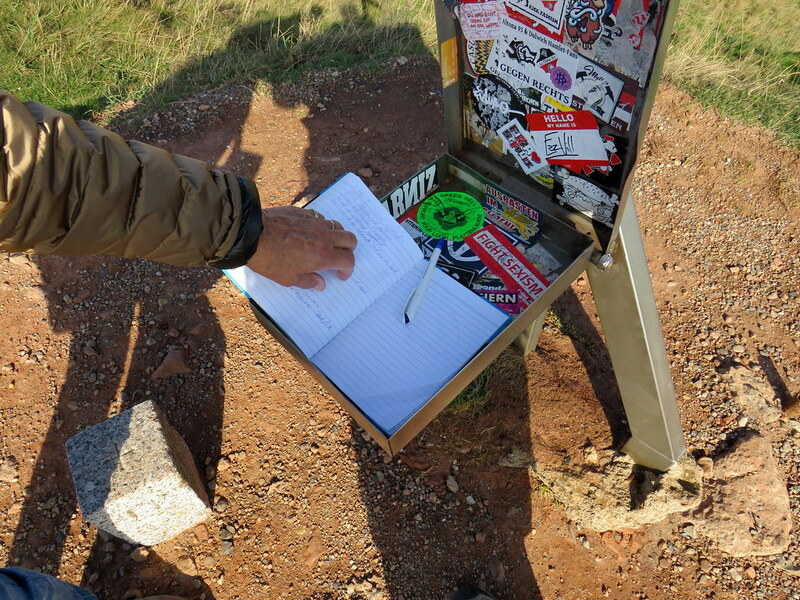 This is actually the highest point in the whole district of Pinneberg For this reason, it has a summit cross and summit logbook. We then returned to the Oberland village. Here comes to most shameful part of this report: We took the elevator to get down to the Unterland village. I was so ashamed I took no photos... The elevator is manned, or rather "womanned", as one woman is inside the elevator the whole day collecting the fare of a few cents. This must be the worst job in Summer and the best job in Winter. The in-laws where happy and stocked up on cigars The time had moved on too quickly as I had one last item on my to do list: Eat some of the local specialty: Knieper. Knieper are crabclaws. After the downturn of the lobster population, this has become the iconic food on the island and I had planned to eat some in a restaurant. However, we only had half an hour left until the boat would be leaving so no time to sit down really. 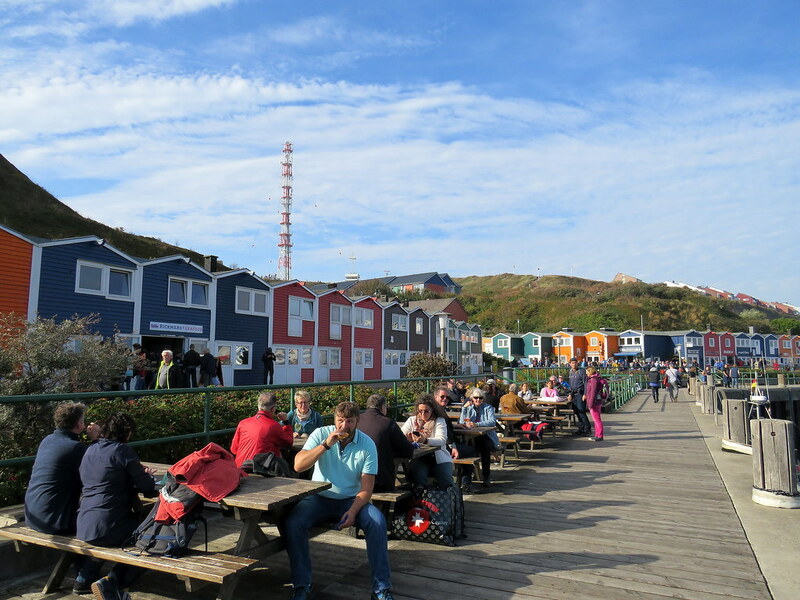 There are some take aways in the lobster huts selling fish rolls (Fischbrötchen). Fish rolls are a staple of the north German diet akin to fish & chips in Britain. We were not the only ones having the idea and the harbor side was full of hungry Germans tucking into their Fischbrötchen. Unfortunately, the Knieper rolls were long sold out. If you want one of these you should head straight to the take away when arriving on the island. So we settled for Krabben (shrimps) which were delicious too. The crowd enjoying the last moments on the island in front of the fish rolls take away in the lobster huts. Whilst our catamaran was moored at the pier, the bigger boats anchor out in the sea and the passengers are ferried forth and back by so-called Börte boats, a practice that was common also in the British isles I believe. All too soon it was time to board the Adler Cat and say goodbye to a fascinating island with so many different facets. 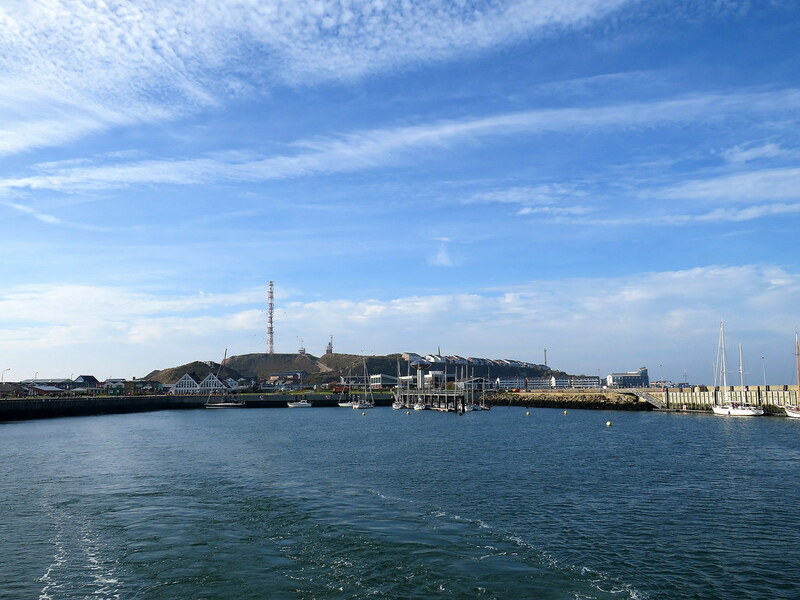 Leaving Heligoland I would have liked to spend more time there. A daytrip definitely is not enough. There was quite some traffic in the sea. At one time we counted as much as 17 cargo vessels. 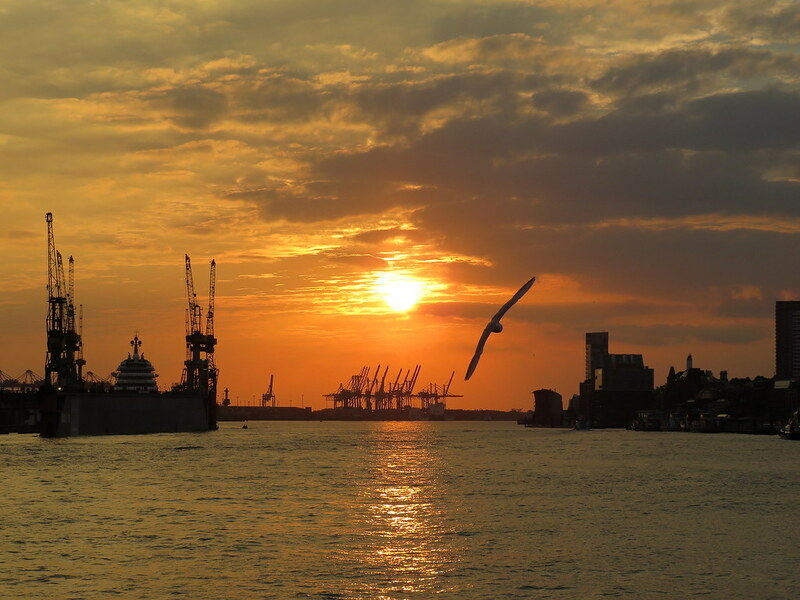 They are heading to or from Hamburg. 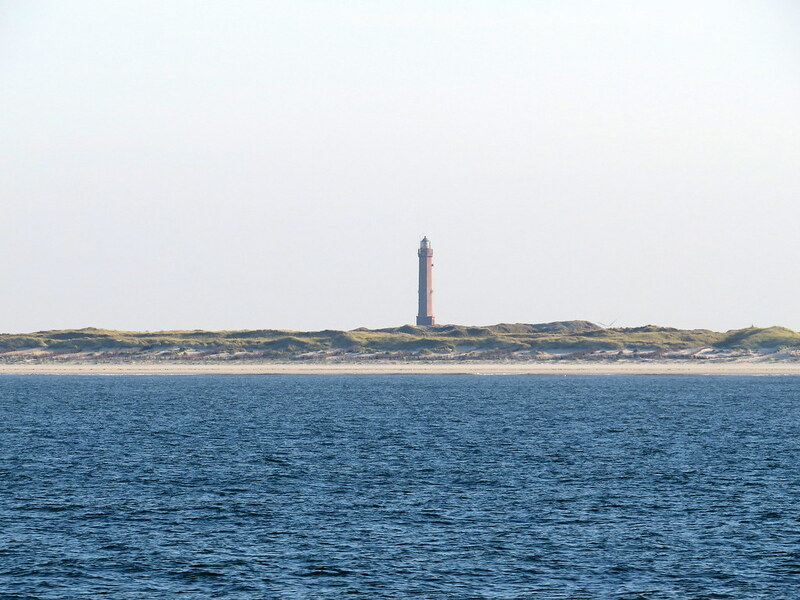 After an hour or so, the familiar light house of Norderney came into view, looking like an watercolor in the evening light. 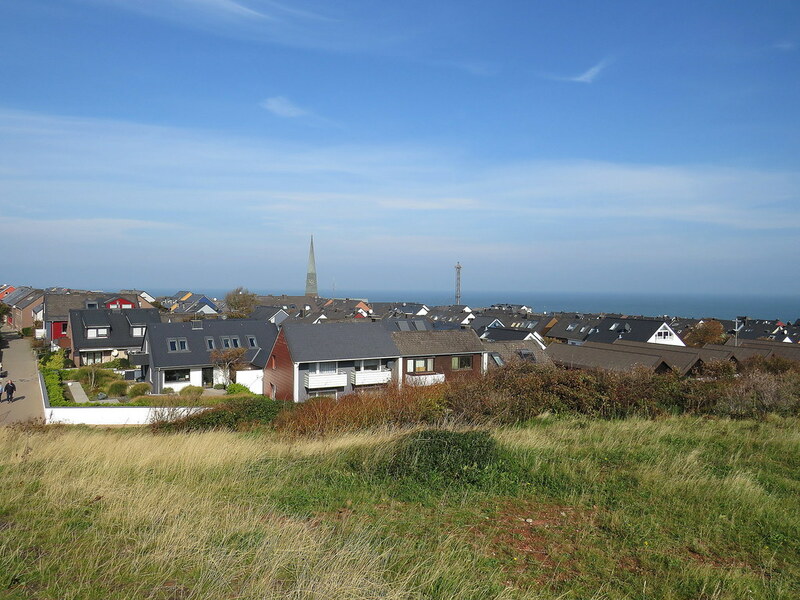 If you found the Pinneberg ridicolous, feast your eye at the Georgshöhe, at 20 meters above sea level. 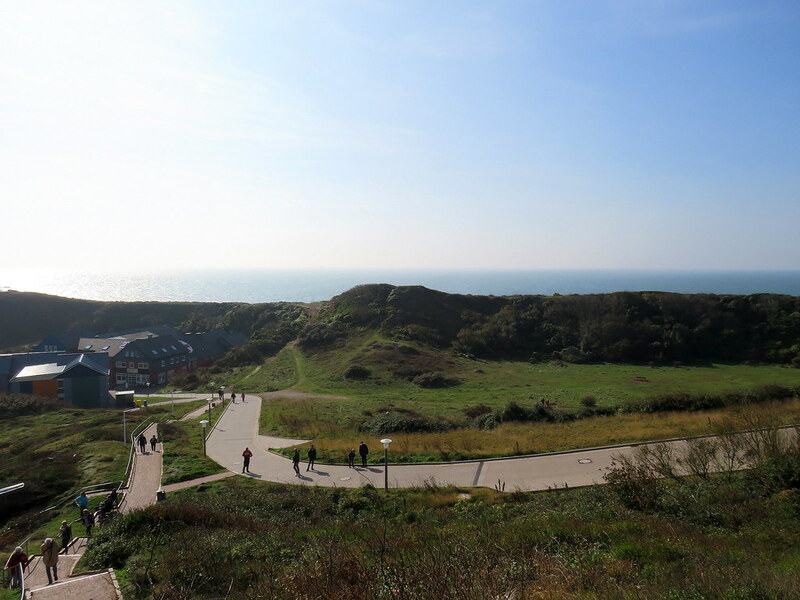 The highest point on Norderney (and as a matter of fact in the whole of East Frisia) is an inland dune at 24.4 meters though. 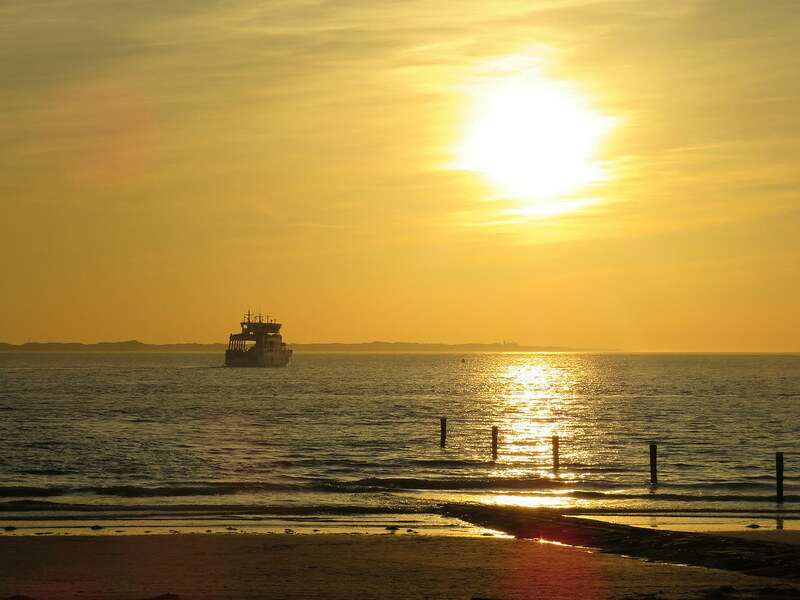 We were back on Norderney in time for another spectacular sunset. It was also our last night on the island. The next day we took the ferry back to the mainland and from there, headed to Hamburg where we took the plane back to Zurich. Operation Heligoland was a success and I can only recommend any island lover to give this little gem a go.